After apologizing for delaying the release of Android 8.0 Oreo for the U11 in Europe, HTC is finally addressing the concerns of those who bought the company's flagship by finally pushing out the update. 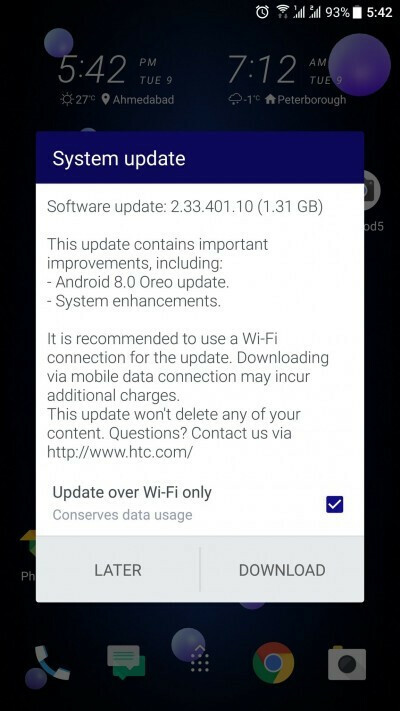 Apparently, HTC has already kicked off the roll-out of Android 8.0 Oreo for HTC U11 in the EMEA region, which includes Europe, Africa, and the Middle East. This is a fairly sizeable update (1.31GB), so make sure you have enough free storage and that your phone's battery is charged. We believe a monthly security patch could be included too, but either it's December (2017) or January (2018), that remains to be seen. Keep in mind that this an incremental update, so it may take some time until it arrives on all HTC U11 units in EMEA. Still, do let us know in the comments if you notice any out of the ordinary changes if you get the update. i got mine updated right after htc announcement on facebook 8 hours back. The only concern is the Security batch which still shows November 2017 ! US U11 received Dec. Security update this morning so they'll get it soon as well.